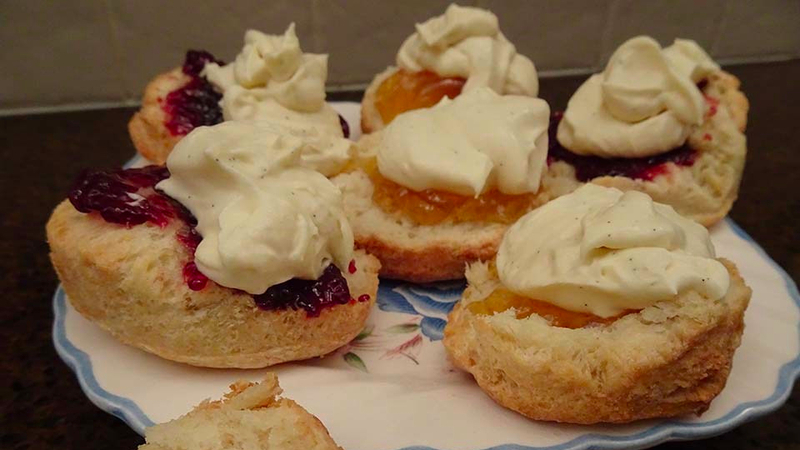 My Gran taught me to make scones when I was a young child. We not only had them topped with jam and cream, but also loved them topped with some cheddar, or tomato and onion done her special way. Finally I have come up with a gluten free recipe that brings back all of those wonderful memories as I make them, and then as I sit and savour the taste and texture. Measure all the dry ingredients into a bowl or into a food processor and mix to combine. Cut the chilled butter into small dice and add to the dry ingredients. Rub the butter into the dry ingredients using your fingertips (or process in your mixer) until the mixture resembles bread crumbs. Whisk the milk, yoghurt and egg white together in a separate bowl and then add to the dry mix. Gently mix with a knife. Do not overwork the mixture. It will be a little sticky. Tip the dough onto a well floured mat or work surface and knead to bring it all together. Using the palm of your hand, pat the dough to 2cm thickness then cut into rounds using a 6 cm/2 inch cutter. Place the scones on the prepared tray, almost touching each other. The dough was always mixed with a knife.